If you are an aggressive investor in growth assets, you’ll be excused if you open your March quarterly statement and think someone has played an April fools’ joke on you. I reckon the period since November was the toughest 5 months for investors in the last decade. Only the big financial crisis of 2008 was tougher, but then at least listed property was still hanging in there. Looking at the chart below, it is clear that growth funds had very little hiding place over the last couple of months. Resource: Allan Gray “research tool”. We are currently, not unexpectedly, receiving piles of e-mails concerning the performance (or rather, lack of performance) of clients’ investment portfolios. Most of the people contemplating the idea of rather stashing their cash under their mattress, are investors who have not yet been exposed to a full market cycle. Five months is however a fairly short period and it is relatively easy to respond to these queries with clever sayings and long-term data findings. But what does one say to someone who has invested shortly before the financial crisis in 2008 and is now looking at his or her figures? 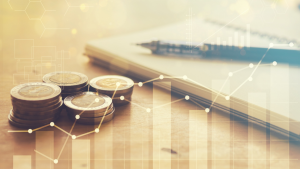 This person can rightfully note that their 10-year figures on their growth assets are by no means even slightly aligned with the realistic expectations over such a period provided to them by their financial advisor or any article at the time. To get a better grasp of growth asset investment and hopefully some insights into making decisions regarding your own future investments, we need to flip back our calendar to 1995. 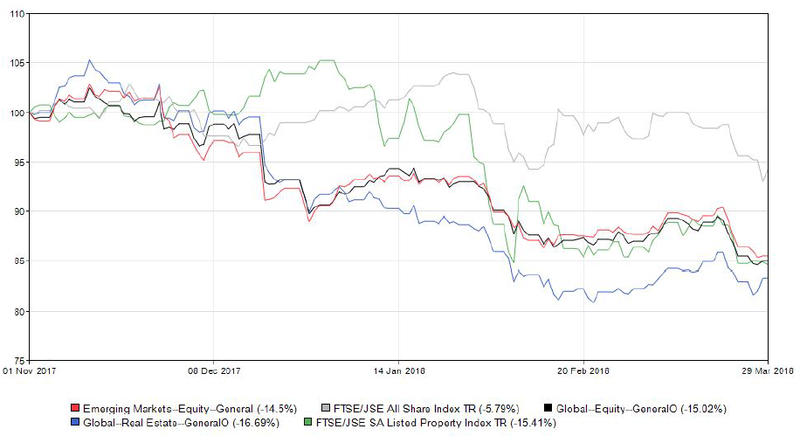 The South African Stock Exchange’s long-term (100 year plus) return is around 7% above inflation (including dividends). During conversations with prospective clients who wanted to invest in growth assets (mainly shares), this figure would have been a good starting point to capture expectations. If you’ve accepted that fund managers and other intermediaries should outperform the index to such an extent that they at least cover their own fee, coupled with your experience of inflation at that point (approximately 8.5% annually), you would be expecting an average rate of return between 15% and 16% per annum over the long-term. We all know inflation isn’t static, so you should adjust your nominal growth expectancy relative to the increase or decrease in the long-term inflation rate. In the graph illustrated below you can see the JSE’s total returns (including dividends) between 1995 and 2017. The ‘inflation + 7%’ target has dropped from 15.7% to 12.8% annually over the last 23 years. Be sure to adjust your own expectations regarding the nominal return that you should receive from shares and other investments. The red bars represent all the years in which performance was lower than the long-term expected return. You would underperform your target return in 48% of the years, but the other 52% would of course make up for that. Investors who kick-started their investment on 1 January 1995 would have earned a measurable average return of 1.08% per year after 4 years. Good luck with convincing this client to believe the long-term story. If the client sold at that point however he or she would of course have missed out on the 71% return the following year and would have destroyed this capital forever. A similar fate would await anyone who invested at the beginning of 2008. After 4 years its average return would have been a mere 5.5%. 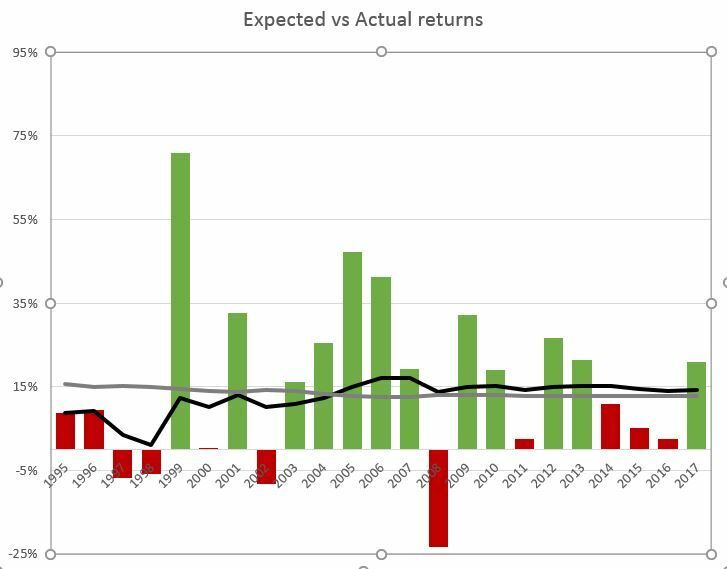 Someone who invested at the beginning of 1999 or 2009 would have, in contrast to the latter scenarios, enjoyed a higher than expected average return which would have systematically lowered over time. Very important: During your investment’s infancy years the average yield is very volatile, resulting in the average often being far removed from your expectation. However, much like the fuel consumption on your car hardly changing after the 100th tank, your investment will also find its long-term rhythm and the long-term outcome is relatively predictable. If you had a weak starting point however, it normally takes more than 7 years to reach a stable long-term average. Notice how the black and gray lines align in the long run. An advisor who told his client to expect a long-term investment growth average of ‘inflation + 7%’ might have been classified as mentally ill after 4 years, but he would have been correct eventually. The person who started investing in 1995 would have had to wait 9 years to come to this realization. The person who started investing in 2008 is still not close to this average even after 10 years! The sad outcome of this late ripening of investments is that many people lose their faith before they reach a good long-term average (can you blame them?) and deviate from their initial plan. To conclude: If you have time on your side and you are invested in quality growth assets and your fees are within limits, try to relax if you are slightly behind schedule. Make sure you understand your relative performance rather than absolute performance. If your timeline is long enough, your outcome relative to inflation (although it doesn’t always feel like it) should be relatively predictable. However, no one (not even esteemed advisors or flashy financial commentators) can predict the order of returns. Andró Griessel is a certified financial planner and the managing director of ProVérte Wealth & Risk Management. Follow him on Twitter @Andro720911. He writes twice a month for Netwerk24.